EDMONTON - New federal research has strongly backed suspicions that toxic chemicals from Alberta's vast oilsands tailings ponds are leaching into groundwater and seeping into the Athabasca River. Leakage from oilsands tailings ponds, which now cover 176 square kilometres, has long been an issue. Industry has acknowledged that seepage can occur and previous studies using models have estimated it at 6.5 million litres a day from a single pond. The soil around the developments contains many chemicals from naturally occurring bitumen deposits and scientists have never able to separate them from contaminants released by industry. The current Environment Canada study, accepted for publication in the journal Environmental Science and Technology, used new technology to discover that the mix of chemicals is slightly different between the two sources. That discovery, made using a $1.6-million piece of equipment purchased in 2010 to help answer such questions, allows scientists to actually fingerprint chemicals and trace them back to where they came from. "Differentiation of natural from (tailings water) sources was apparent," says the study. The scientists took 20 groundwater samples from areas at least one kilometre upstream and downstream from development. They took another seven samples from within 200 metres of two of the tailings ponds. Samples were also taken from two different tailings ponds. The analysis was focused on so-called acid-extractable organics, which include a family of chemicals called naphthenic acids. "Their enhanced water solubility makes them prime candidates for possible migration beyond containment structures via groundwater," the report says. Those toxins were found in groundwater both near and far from development. But their chemical composition was slightly different nearer the mines — closer to that found in the water from the ponds. "Analyses all demonstrate a close similarity between these two (near) samples and (tailings water), as opposed to the natural far-field groundwater," the report says. "The resemblance between the (acid-extracted organics) profiles from (tailings water) and from six groundwater samples adjacent to two tailings ponds implies a common source. These samples included two of upward-flowing groundwater collected (less than) one metre beneath the Athabasca River, suggesting (tailings water) is reaching the river system." The study doesn't quantify the amount of tailings ponds water that is escaping. It noted that even at the sample sites near development, pond water was diluted by natural groundwater. Environment Canada said it was unable to provide an interview with the report's main author, Richard Frank. In an email, department spokesman Danny Kingsberry downplayed its findings. "This study does not provide proof that the oilsands process water may be reaching the Athabasca River at the sites examined. Techniques are being further developed and applied to a wider range of shallow groundwater locations in the area to repeat these results and to further assess regional tailings pond/groundwater interactions." 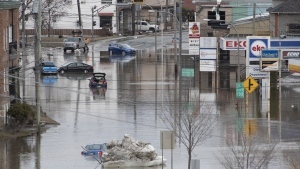 The research was conducted under Environment Canada's regular research program. It is expected to feed into studies funded by the Joint Oilsands Monitoring Program run by the federal and Alberta governments and funded by a $50-million levy on industry. Industry is working to address the tailings issue, budgeting more than $1 billion in tailings-reduction technology. Groundwater is monitored at all tailings sites to ensure it's flowing as expected. Operators use ditches and cut-off walls to capture seepage and runoff water, and install groundwater interception wells. Captured water is pumped back into tailings pond. Mark Cooper, spokesman for the Canadian Association of Petroleum Producers, said the quality of water in the Athabasca River remains good. "Current tailings pond and groundwater monitoring in the oilsands shows no substances being released or predicted to be released in quantities or concentrations that would degrade or alter water quality," he said. "This study does not change that." Cooper said the association supports research such as the Environment Canada study and echoed its call for more research in the same vein. "While the research technique used in this study shows some potential, further detailed work is required to evaluate its accuracy and adequacy for tracking oil sands process water." Note to readers: This is a corrected story. An earlier version said the research was conducted under the auspices of the Joint Oilsands Monitoring Program.